LOX-8 Grease is engineered to lubricate in harsh chemicals applications where extreme acids or powerful oxidizers are used. It prevents stainless steel galling and withstands high pressures and both high extreme and cryogenic deep freeze temperatures. It is oxygen-safe, waterproof, and versatile, making it an all-purpose plumbing and O-ring lubricant. Works great with oil-based systems, hydraulic oils, and fuels. 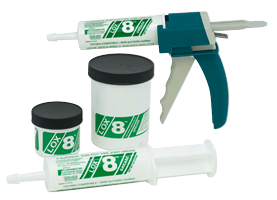 LOX-8 is recommended for use as both a lubricant and as a sealant by The Chlorine Institute members. Formulated for wet conditions and dry applications. Odorless. Remains stable up to 450°F. It is nonflammable and nontoxic. Not affected by harsh chemicals such as chlorines, hyperchlorides or powerful oxidizers. Oxygen-tested by The German Federal Institute for Materials Testing (BAM) and ASTM G72-82 and ASTM G86 (NASA).